The Tropical High Elevation House is a playground of miniature orchids. 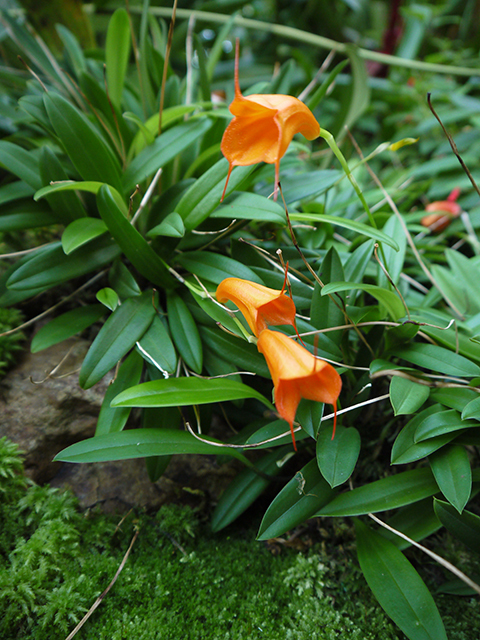 A few, like this Masdevallia, are tucked into moss among the rocks. But most are on tree branches at eye level and higher. Lots of plants that grow at high elevations are quite small. Discovering an exquisite treasure like this can be a thrill for anyone who is willing to slow down and look carefully. Many Masdevallias are teacup sized. Within this group of ~300 species and many hybrids is an astonishing variety of flower colors and shapes. They are a botanical candy shop. Most Masdevallias enjoy cool conditions, meaning a 52 degree night and 72 degree day. Some are fine with slightly warmer temperatures. They thrive in shady locations away from direct sun. They like high humidity (80% R.H.) with air movement, a difficult combination that pretty much excludes your living room. Many people do well with them in small pots of sphagnum under lights in their basement, with a small oscillating fan supplying the air movement.